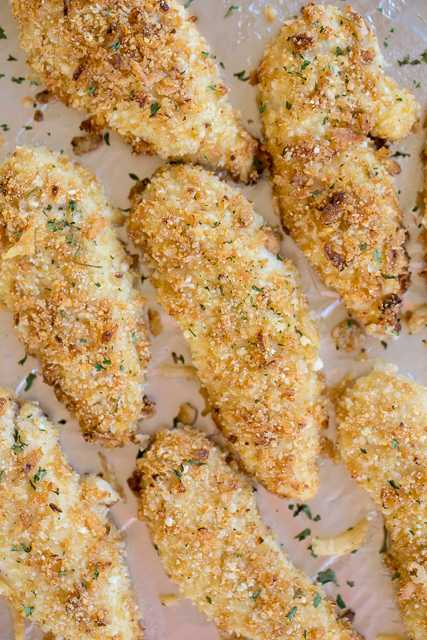 Cheesy Onion Chicken - chicken tenders coated with french fried onions, parmesan cheese, panko bread crumbs and garlic.The flavor is FANTASTIC! Baked not fried! Can make ahead and freeze for later. Great as a main dish, on top of a salad or in a wrap. Everyone LOVES this chicken! 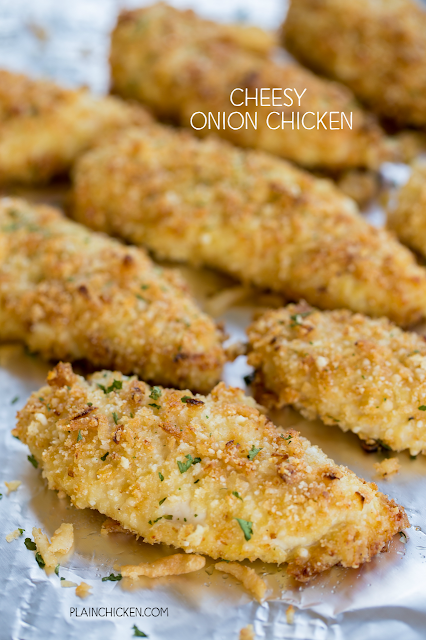 This Cheesy Onion Chicken received rave reviews in our house! They were SOOOOO good!!! Chicken coated in French fried onions, parmesan cheese, garlic and panko bread crumbs. YUM! The flavor is fantastic! These can be made ahead of time and frozen for later - baked or unbaked. This recipe is for two pounds of chicken tenders. I made the whole recipe, and we ate these for lunch and leftover for dinner. They are great on their own or chopped up on top of a salad or in a wrap. We have made these a few times and they are always a hit! We bake the chicken on a foil lined baking sheet and spray them with a little cooking spray before baking. They turn out nice and crispy!!! Preheat oven to 400º F. Line a baking sheet with non-stick foil. Set aside. Combine crushed fried onions, parmesan cheese, panko bread crumbs, and garlic powder in a shallow dish. Whisk together eggs, mayonnaise and water. Pour into a separate shallow dish. Dip chicken tenders into flour. Shake off excess. Dip into egg mixture and then coat in fried onion mixture. Place on prepared pan. Lightly spray chicken with cooking spray. Do you flip them half-way through baking? OK, I just made these for the second night in a row, by family demand! Adding the mayo makes all the difference. I never thought about it but that's what make them so crispy without frying. I had to explain to my kids why I couldn't substitute Miracle Whip-it needs the oil. Thanks for a delish recipe!! Will this work on small boneless skinless chicken breasts (like 4 oz each)? Or maybe chicken cutlets? This looks really good, but I hate buying chicken tenders, b/c they alwasy have that white tough piece.